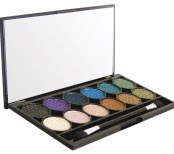 "The Original i-Divine palette contains a variety of highly-pigmented colours, ranging from green to purple, allowing you to create endless looks fit for day or night. The velvet-touch consistency gives full and shimmering coverage to the eye lid for maximum effect. Each of the 12 shades can be applied alone for a dramatic effect or mixed to create a personalised look." The first time I used it I used this applicator and it wasn't bad, although I prefer my own brushes. The shadows are beautiful and the colour range is gorgeous. The black eyeshadow is matte the rest are shimmery (which I like but I would have liked a matte brown in there). In this FOTD I used the black and purple. The packaging is sophisticated and modern, but still feels sturdy. Its very thin so its easy to travel with and contains a large mirror and applicator. I used these eyeshadows on my mum and myself. She loves the two neutral brown shades. I'm matte girl at heart and I rarely use shimmery eyeshadow but these eyeshadows don't look glittery; they appear frosted and slightly 'wet' looking. Its a beautiful finish and really captures the light. They are highly pigmented and don't give off too much fall out. The colours are much more vibrant than they appear on camera and would suite most skin-tones. Really good quality and value for money. An great product. You can purchase Sleek products on the Sleek Website or at Superdrug. As far as I know these are only available in the UK. YES!! I hope to try all the sleek palettes in this range. Purchased by me. An Independent and Honest Review. I really wanted to try the sunset one, they look really great, it's a shame they only sell it in the really big superdrug's though, it's not in any of my local stores. I dont understand why the palettes are so similar?! apart from acid of course...haha!